I wrote this 18months ago, but decided it would be nice to repost it here because the sentiment remains the same. 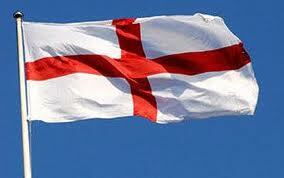 I get sick of being called anti-English just because I am pro-Scotland. It really doesn’t follow. Ok, I’m being blunt here, but it’s true. If we’ve got two years to settle this Referendum for me this is something I want off my chest and out of the way before we go much farther. Yes, I am Scottish and do not identify with the word British except as a geographical and historical concept. I certainly do not choose to conflate it with the word English. I find many connotations of the historical aspect of the word British abhorrent, in much the way I find the British National Party abhorrent. The jingoism and the superciliousness I associate with the BNP and the colonial British Empire are things I would not like other people to associate with me. I apologise if you personally associate with those words in a different way and my stance is offending you, it would be hypocritical of me not to. Can we choose to understand it as a dispute of linguistics, and not of personal Identity? according to Professor James Mitchell of Strathclyde University, these attacks are odds with the reality of contemporary nationalism. In his recent study, The Scottish National Party: Transition to Power, Mitchell argues that the party’s understanding of national identity is perfectly consistent with the standards of 21st Century liberalism. He writes,the SNP is civic in the sense that its policies are among the most liberal of any party in the United Kingdom on citizenship, emigration and multiculturalism. Additionally, very few of its members would define Scottishness in exclusive ethnic terms. The SNP membership accep! ts a plurality of ways (being Scottish).” In other words, for the majority of SNP members, Scottishness is something an individual chooses, rather than something he or she has foisted on them by birth or through the bloodline. Yes, I would be willing to call myself a Scottish Nationalist, or perhaps, worse still, a cybernat, but just as the good professor explains above, that doesn’t actually have to make me anti-english at all! I do what I do because I can see their is an opportunity to be seized upon here, a chance to make things better for Scotland and the folk who live here simply by allowing ourselves the freedom to make all the decisions about Scottish affairs here in Scotland. And finally, yes, I will be voting Yes in 2014. This has got nothing to do with wanting to cut Scotland adrift at Hadrian’s Wall so we can physically isolate ourselves from the English. Actually, if that were possible and we could row Scotland to the Caribbean for better weather, then I’d want to take the English with us too, frankly. We’re all a bit pasty and lacking in vitamin D here in the British Isles. Can someone give Ireland a tow too while we’re at it? Oh, wait, I’ve ticked all the anti-English boxes there, haven’t I? I’ve said Yes, I’m Scottish, not British. Yes, I am an SNP voter. Yes, I am even an activist and I will vote Yes in the Referendum. I’ve made my Declaration of Scottishness and declared common ground with the anti-English party. You may now feel that you can now be at liberty to call me anti-English with impunity,but that really does offend me, because a fundamental part of what I believe in is an all-inclusive society. In fact, I want the charge of anti-Englishness put to bed now so we can get on to real reasons why we would want to go down this path. There could be some vision in someone’s head, doubtless, of an SNP conference gathering sounding like something out of Monty Python’s Life of Brian, but in the negative. In this hypothetical head, the cry will be imagined “What have the English ever done for us?” to be followed by some horrendous list of charges of stealing all our oil, our industries and dumping their toxic waste on us. But that’s not reality, sorry. For starters, nobody in Scotland truly lays the blame for these things at the feet of the English people, we know exactly who is responsible for them. It’s the Government in Westminster at fault for these things, and I most certainly do not conflate the Westminster Government with the English people. England is a wonderful country actually, with a fascinating, parallel, history to our own, a long history too, with a deep culture and a wonderful language for expressing all of that in. So, in honour of one great bastion of Englishness, the aformentioned Monty Python, here is my own little list of “Things the English have done for us.” It’s by no means comprehensive, and it’s largely based on my own tastes, but I hope it proves my point! And I could go on, but this is more than enough to start with! Thank you, England, I love all of these things you’ve given us, but I’m sorry but I still think I’m going to vote yes. Why? because you gave these things to the whole world, and I just want my wee northern nation to be part of that whole world. And, I’d like to see you become part of the whole world too, because I think you secretly want to be able to just call all these wonderful things English and be done with it, and I’m entirely behind you on that one. 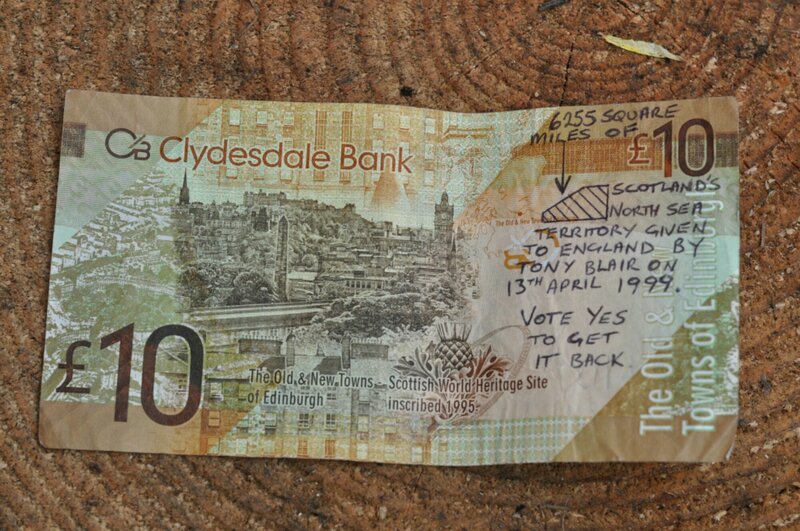 Went into town today and got this from the Clydesdale Bank cash machine. 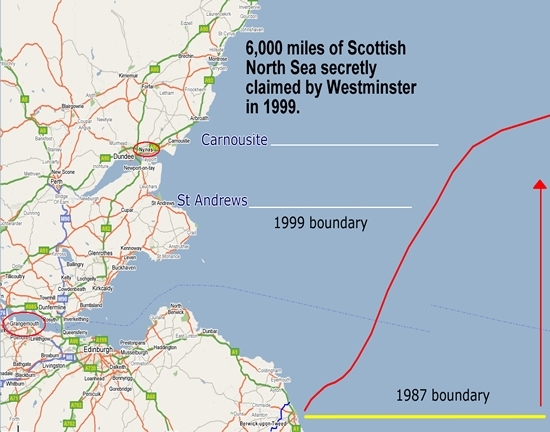 I knew about this, but I’m a reasonably well informed, lifelong supporter of Scottish Independence. Then it might not have been us at the Cash Machine, it might have been someone who didn’t know. We’ll pass it on now we’ve taken this picture, we’ll let it do the job it was intended to do. Further reading the matter can be found here. Edit. Sitting in a local arts centre, listening to musicians jamming. Just spent the tenner.